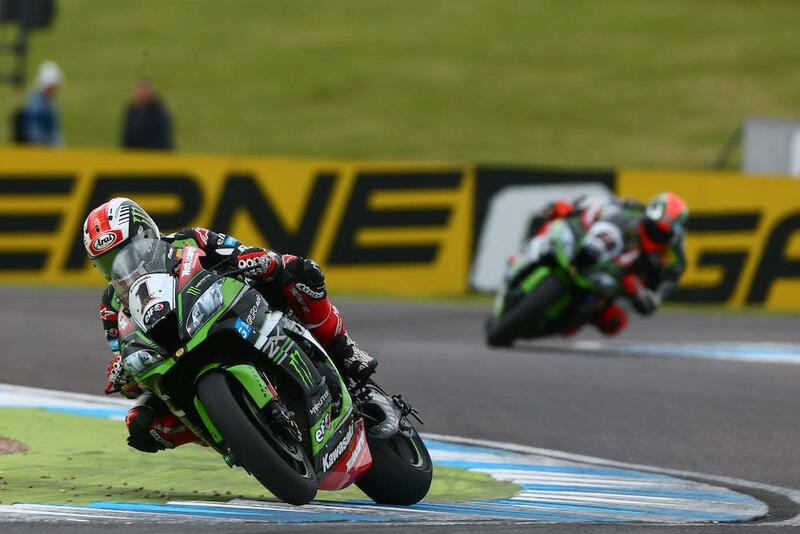 Jonathan Rea put an end to Tom Sykes’ dominant Donington winning streak as he bounced back from yesterday’s crash to take victory in this afternoon’s second World Superbike race. Despite starting tenth on the grid, Rea got a lightning start to find himself in the top three by the end of the opening lap, before taking the lead at Redgate on lap two. Leon Haslam also got off the line well, as did Michael van der Mark from his front row start, with a gaggle of riders battling for third with Rea and Melandri in front. Haslam’s race wouldn’t be the fairy tale ending he enjoyed on Saturday as he became victim of van der Mark pushing Mercado wide, who when turning back towards the apex clipped Haslam sending him off the track at Goddards. Aruba Ducati’s Chaz Davies was also caught up in the incident, running on the grass and ending up re-joining in 15th. Marco Melandri tried with a technical problem early on, as Tom Sykes fought his way through the pack passing van der Mark to begin his attempt to chase down Rea in the second of the race. 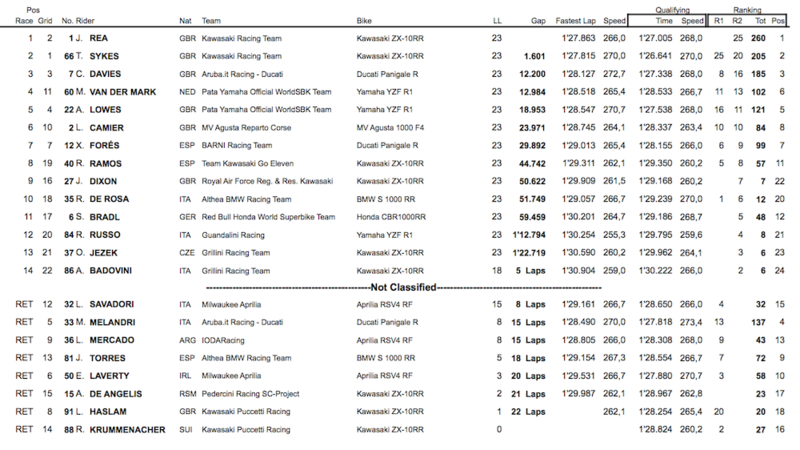 However, despite frightfully quick pace for Sykes, Rea always had a response and was able to manage the gap with sat at 1.6 seconds as he crossed the line to take Kawasaki’s 100th WorldSBK victory. Davies enjoyed a strong fightback through the field to pass van der Mark and complete the podium in the final stages, with Saturday podium man Lowes crossing the line fifth ahead of Leon Camier. Xavi Fores took seventh, ahead of Roman Ramos and wildcard Jake Dixon, riding on his BSB-spec machine, clinching an impressive ninth. Raffaele de Rosa completed the top ten.